1/2 yard silk or silk poly blend. Cut each in half across the grain, selvage to selvage (so you have two long pieces). Sew each set together (at the ends) so you end up with two very long pieces. Sew right sides together, leaving one end open. Top stitch around the edges. The gifts are flying off the needles right now. Most I can’t post about quite yet, but these two are gifts that were already given away the other week. I made both our midwives as a thank you for all they did in helping our family to have the homebirth of our dreams. MAJOR scare before I gave this to her. Both our midwives were here for our final follow-up appointment. Midwife #1 was admiring Spinner’s longies, when Midwife #2 said she wished should could knit them, but she had developed a wool allergy and couldn’t wear or knit with it anymore!! Immediately I thought of her scarf sitting on the table in a gift bag….what do I do??? Yikes!! 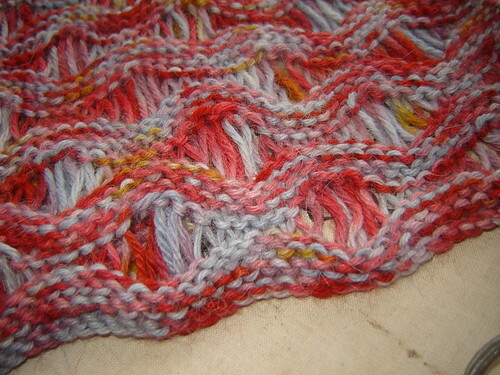 Then I remembered it was knit with Atacama Araucania… alpaca!!! I chanced it, gave it to her, and she loved it. She reported back later that she wore it all day and not and itch! This was a quick knit. 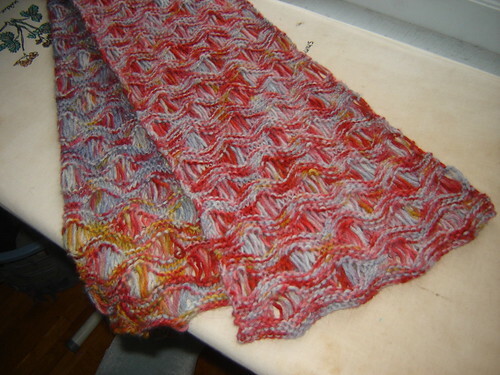 There is a similar free pattern on Ravelry if you’re interested. 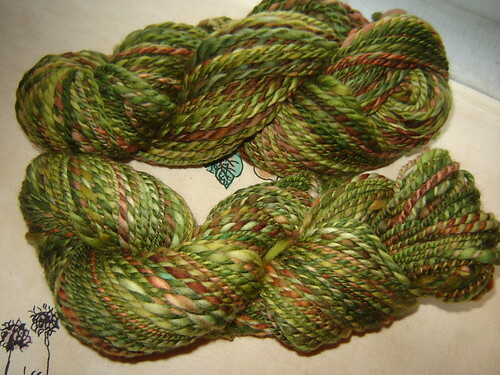 Next up, for my other midwife, is the Crown Mountain superwash merino I had shown you on the wheel a few weeks ago. I plied it up and it ended up being somewhere between a worsted and bulky weight; maybe a size 9 needle? It turned out lovely and pretty even. A few thick or thin sports here or there but mostly the same thickness. And the color was so nice. I wish it had been sunnier when I photographed it. Both of these women are such generous, amazing people. I couldn’t imagine going through another pregnancy and birth without them!